If there's one item that'll quite literally keep us covered through the entire season, it's the moto jacket. The right style will not only warm you up on those crisp days but also make your outfit infinitely cooler. And nobody understands this more than our favourite celebs! Below, we're highlighting how A-listers like Kendall Jenner, Gigi Hadid, and Jessica Alba style their favourite moto jackets. Keep scrolling for primo styling inspiration. And if you're feeling inspired to shop for a new moto yourself, scroll a bit more to check out a few of our favourite styles of the moment. If you're looking to brighten up a dark look ever so slightly, a midnight-blue biker jacket like Gigi's here is just what you need. On Hadid: Tart Collections Justice jacket; Blue Life Fit Zipper Motto Leggings ($175); Ray-Ban Crystal Blue Aviator Metal Sunglasses ($170); Max Mara tote. We love how Chrissy gave her knot dress an edgy spin by draping a brown moto over her shoulders. On Teigen: Joseph Elle Tie-Front Wool Dress ($355); Acne Studios Leather Mock Moto Jacket ($1600); Saint Laurent Open-Toe Lace-Up Croc-Embossed Leather Booties ($1095). A cropped style feels slightly more femme to balance out Kendall's military-inspired pants here. On Jenner: Laer Cropped Moto Leather Jacket ($700); Ronnie Kobo Cori Pants ($304); Dior So Real Brow Bar Sunglasses ($595); Givenchy Lucrezia Bag; Gianvito Rossi Ellipsis Pumps ($765). Pair a moto jacket with an on-trend leopard-print top for a cool-girl twist. On Huntington-Whiteley: Saint Laurent Leather Biker Jacket ($4990); Saint Laurent shirt; Paige Transcend Hoxton Jeans ($179); Givenchy bag; Ray-Ban sunglasses; Saint Laurent boots. A pink moto adds an unexpected pop to a frilly dress like Jessica's iteration here. 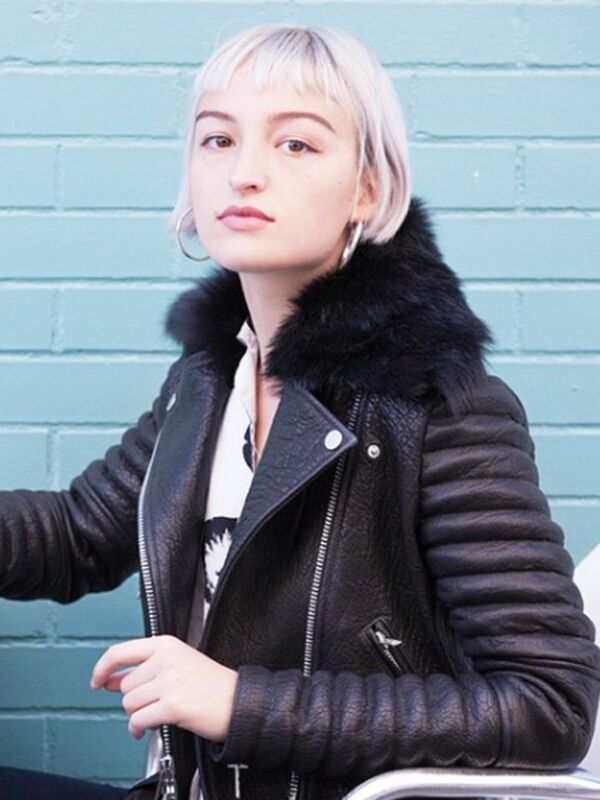 On Alba: Iro Ashville Leather Moto Jacket $840); A.L.C. Halter Printed Handkerchief-Hem Dress ($625); Kenzo Kalifornia Bag; Casadei sandals. There's nothing more classic than a black moto-and-LBD pairing for a night out. Right, Beyoncé? On Knowles: Saint Laurent jacket; Self-Portrait dress; Manolo Blahnik BB Pump Black Suede ($595). What's your favourite style? Let us know your thoughts in the comments below!